This guide serves as a quick reference source for common WIM topics. 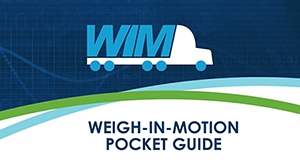 The guide provides sufficient technical details that enable traffic monitoring professionals to make sound decisions on WIM-related issues. It is built on states' successful practices in using WIM systems and references the available standards and guides related to WIM data collection. It contains practical advice and easy-to-follow instructions and illustrations. In addition, the guide has four instructional video supplements that show installation for different types of WIM sensors. The guide also contains appendices that provide guidance on the various elements of procuring, installing, and maintaining WIM systems.